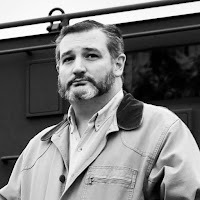 Sierra Sentinel News- Serving The Sierra Nevada Communities: Cruz has new 'FACE' friend! he was in Texas last week, and some didn't recognize him. His new BFF is a mustache and beard and it does nothing for him. He stated that NO ONE outside Washington DC cares about Trumps ties to Russia! Perhaps the people who support him are that stupid, but he should really get out more! This guy is one of the worst liars in the world!